By the start of the 20th century America’s fascination with new motorized vehicles was in full swing. Fueled by the recent inventions of the automobile, airplane and motorcycle, the popular culture surrounding these new exciting means of travel also began to grow. 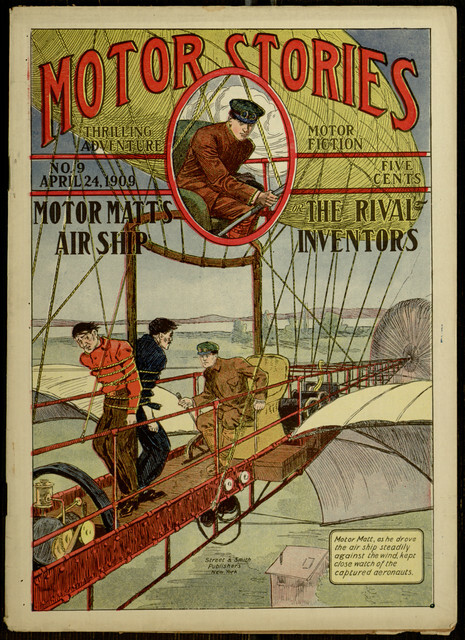 A dime novel series entitled Motor Stories exemplifies the growth of this new popular culture. This dime novel series follows the adventures the young mechanic Matt King, appropriately nicknamed ‘Motor Matt’ or ‘Mile-a-Minute Matt’. Throughout the 32 issues Motor Matt finds himself at the helm of various motorized vehicles in pursuit of villains from all over the world. Motor Matt is portrayed as an everyday lad whose moral compass guides his every move, which is often challenged by the issue’s antagonist. The author of Motor Stories, Stanley R. Matthews, aims to make Motor Matt an average and relatable boy. The lessons learned by Motor Matt and his friends are ones that the reader can also learn. For us here at Villanova, Motor Matt holds a different meaning than he did to his contemporary readers. Motor Stories was part of a generous multi-series dime novel acquisition from noted popular materials collector, Joe Rainone. It also happens to be the first complete dime novel series to be added to Villanova’s Digital Library. Not only is the Motor Stories series a pioneer in Villanova’s Digital Library, but it also made headway in dime novel culture. The Motor Stories series have been reprinted and adapted under multiple series and titles. 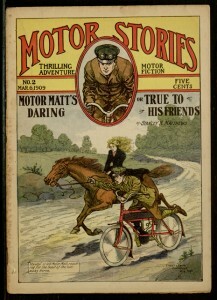 Stanley R. Matthews, Motor Stories’ author, was a pseudonym for William Wallace Cook, one of the most prominent dime novel authors. William Wallace Cook also penned a ‘how-to’ book on writing short fiction entitled Plotto. In Plotto Cook describes, essentially, various plot combinations, most of which were used time and time again in dime novels. It is no surprise then to discover that Motor Matt shows up in other series such as Brave and Bold, Alger Series, Medal Library, Adventure Library and New Romance Library. Perhaps one of the most interesting evolutions is that of Motor Matt into Bob Steele. The Bob Steele character turns up in the Motor Power Series, which was a longer, hard cover publication which combined and revised issues of Motor Stories under the new pseudonym Donald Grayson. This method of recycling plots and characters is an example of how Cook intended his Plotto manual to be used by other authors.